The holiday season can be hard. Not only do you have to eat and drink a ton of delicious food and beer, but you also have to receive presents from people who love you. It’s a tough holiday world out there, but hey we get through it the best we can. If you’re struggling to find that perfect holiday gift for your loved ones, look no further as the Denver Beer Guy has got you covered. I know the intricate dynamics of human and family relationships well, and know exactly what each member of your family needs this holiday season. Without further ado, here’s my list of family beer gifts for 2o13. I don’t have to tell you how hard Moms work during the holidays. Most of the cooking, cleaning, and holiday decorating duties fall to them, even in our ever-changing gender role dynamics world. Just once, it would be nice for the Moms of the world to have the rest of the family wait on HER during the holidays. Give this to your Mom, and be ready with a beer in hand when you hear her ringing. Unless you’re from Wisconsin, your sister is probably a bit of a light-weight when it comes to drinking craft beer. She might love it and definitely contribute to the growing craft beer community, but she’s probably struggling to finish a 750mL of barrel aged beer on her own. Help her out this holiday season and avoid dreaded “fallen soldiers” with these beer saver caps. Does you brother already have the cuffed skinny jeans, over-sized beanie, and ironic thick-rimmed glasses that he may or may not actually need? If so, get him some hipster soap that’s sure to make him the envy at his local coffee roastery. 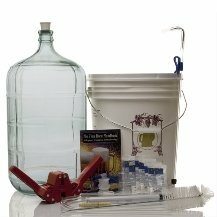 We all know how much Dad really wants to be a head brewer, even if he knows nothing about chemistry and his only brewing experience is with a Mr. Beer kit. Make him at least feel the part this holiday season with a Beer Beard, without him having to grow the real, itchy thing. The Beer Nerd’s beer glass of choice. So you can always find the best beer bar, wherever you are. Brew your favorite beer, right at home.